The sky is always ready to give a show at any moment. On 6 June 2013, at 21:26 UT,while doing other scientific activities at Virtual Telescope, we received an alert reporting that a GRB event was detected by the SWIFT space mission(NASA). The even was labelled as GRB 130606A. Telescopes all around the world slewed to the location of the explosion, hoping to capture the optical counterpart of this burst. It is worth to mention that Gamma-ray bursts (GRBs) are the most powerful explosions the Universe has seen since the Big Bang. Observatories from Spain, South Africa and Canary Islands reported that an afterglow was visible (this is always a great scientific event), so we decided to join the campaign. At 23:00 UT the PlaneWave 17″ robotic unit was slewed to the location of GRB 130606A and the system started taking 300 seconds, unfiltered frames. All this without guiding, trusting the Paramount ME robotic mount, so saving very precious time, wasted otherwise to find a suitable guiding star. As soon as the first image was downloaded from the STL-6303E CCD camera, we performed the astrometry and recorded a faint source at the very same position where others were reporting the afterglow. So, we succeeded detecting it and managed to get a few more frames, to get a final better signal-to-noise ratio. The image above is the average of all the 8 frames we captured. Spectroscopy from large telescopes showed the event happened at redshift z=5.9, that is about 12.7 billions of light years from us. 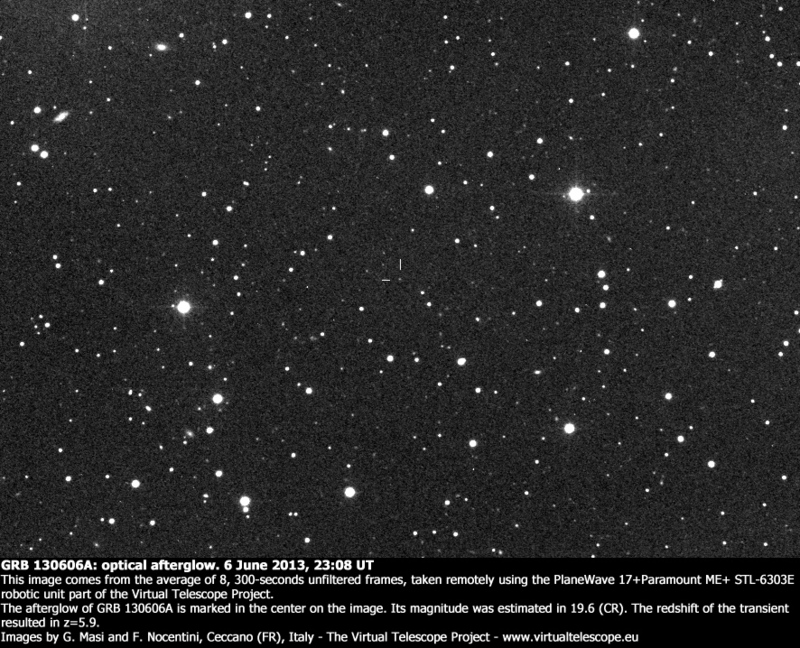 To date, this is the most distant object ever seen at Virtual Telescope.